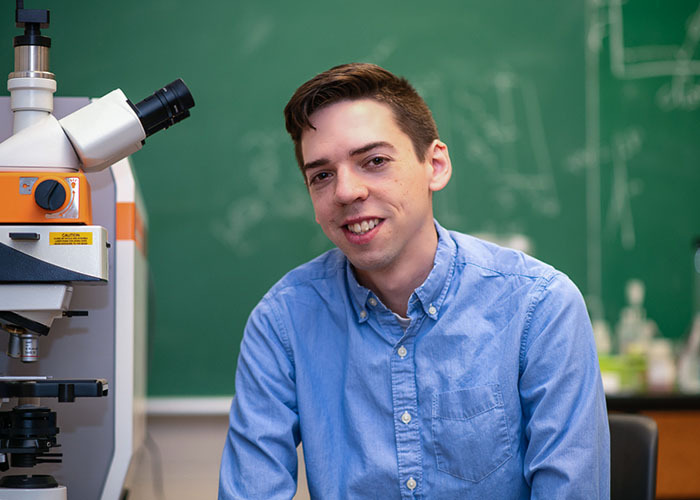 LUCAS STEWART HAS an ambitious list of goals for Spectroleum Labs, the Memorial University spinoff company he helped launch in 2016. First, for Spectroleum to develop a product that increases the efficiency of water analysis and monitoring. And that links into the larger goal of protecting the ocean. Along the way, Mr. Stewart hopes to help grow the local laboratory, environmental monitoring and chemical sensing sectors. Mr. Stewart and his colleagues work in materials chemistry (“Making certain materials that can be used to perform certain tasks,” he says). They are currently developing a substrate that will detect organic pollutants in the produced water of the oil and gas industry. Our end game is to have a viable lab company right here in St. John’s. Spectroleum is halfway through a two-year project funded by InnovateNL and is “pretty confident in what we have.” By the end of year two, Mr. Stewart expects to have a substrate for water analysis in the lab. The next step will be to develop an inline system so analysis can be done offshore and on-site. “We hope that our method, with our substrates, will be quicker and cheaper than the current testing methods,” Mr. Stewart says. He envisions the same technology eventually being used to test drinking water, among other applications.